Well the day actually came, no more scrolling through my Instagram or looking on Twitter, I finally arrived at one of the most talked about cafe spots - Elan cafe. It has been on my wish list for almost a year and on a bright and sunny Saturday morning, Lydia and I made our way to Victoria and quickly jumped on the bus which stopped two minutes away from the Brompton based Elan cafe. 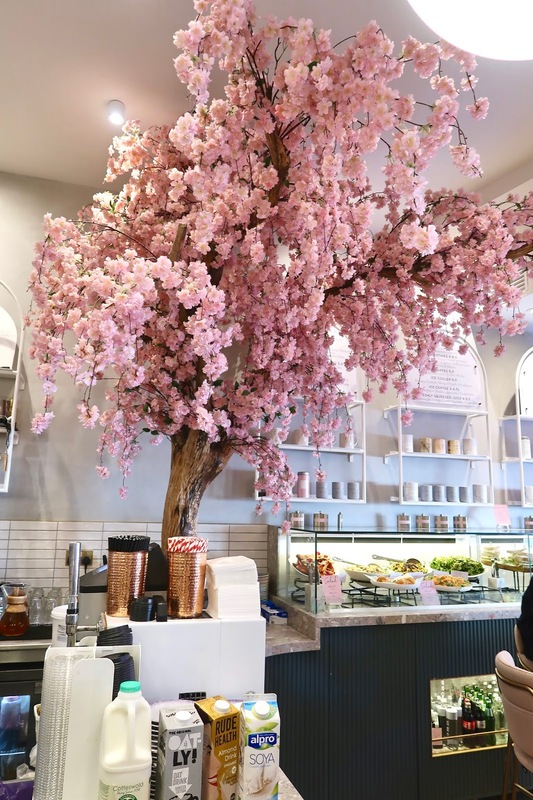 Known for a beautiful flower wall interior and a photogenic menu, I was excited to see if Elan was worth the hype. We arrived bright and early at 10am and we were hoping that it would be quiet. Now there are actually three Elan Cafe's, including a newly opened cafe located near Oxford Circus. We decided to visit the Brompton branch because we were taking a little trip to the V&A museum afterwards and both were in walking distance. 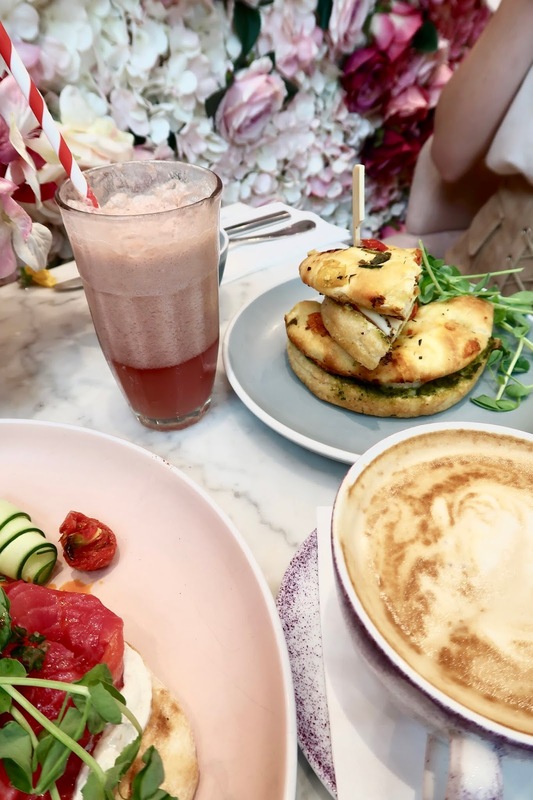 The Brompton road location is certainly a dream location for any new business and the queues for Elan usually finish at the end of the long road. 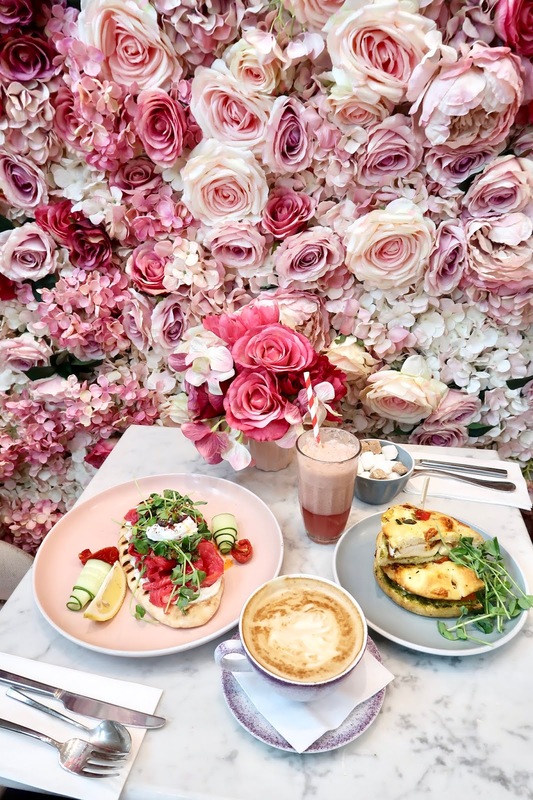 To be seated next to the infamous flower wall, you can ask the waitress that you want that specific table. We only had to wait 10 minutes and we walked to the back of the cafe and we were handed menus straight away. 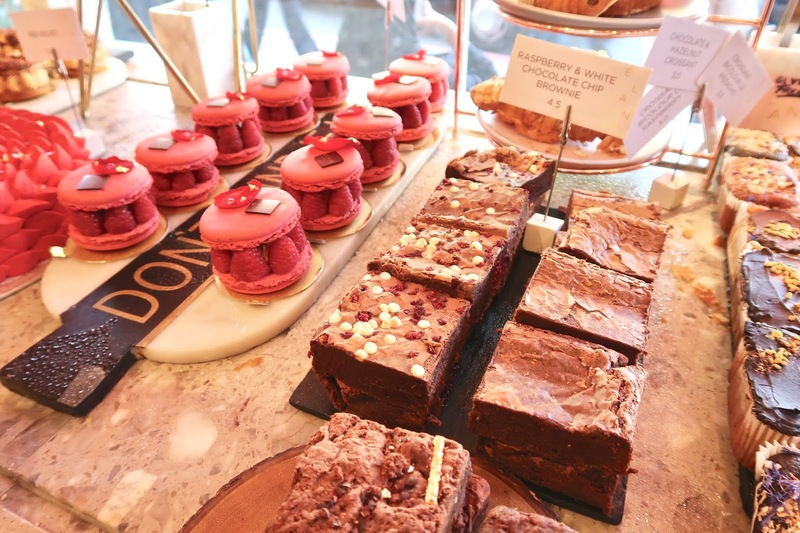 As you enter the cafe, a large display of cakes are neatly displayed at the front near the window and there is a lot of seating available. When we sat down, we were handed the menu and I really liked that the pink design and font matched the vibe and the interior. Yes, this is a small detail but you can see how much thought has gone into creating this magical place! I also didn't realise how much food was available in the cafe. My first impression of the menu? Although there are quite a few cakes and pastries displayed at the front of the cafe and on the menu, I am really surprised how healthy the menu is especially the main dishes. From sour dough bread, fresh avocado and even fruit bowls, there was not a greasy, fried item to be seen. We all know how much I love savory guilty pleasures so it was a really nice change to see healthy, pure and fresh ingredients for once. I decided to order a cappuccino and for my main, I picked the Home Cured Beetroot Salmon with Poached Egg on Flat Bread. It arrived promptly and of course I began snapping away. The presentation was very pretty and the coloured plates and cups matched accordingly. I was really happy with my menu pick because I didn't feel bloated afterwards and it was quite refreshing to eat a fresh and healthy option. I think it says a lot about how much social media has impacted our everyday life, the response and interest about the interior is incredible. By the time we left, there was a queue down the road just waiting to get inside. To be totally honest, I didn't even know much about the menu or even what type of food they had available before I arrived, I had only seen hundreds and hundreds of social media photos of the interior and rightly so - the interior deserves the hype! 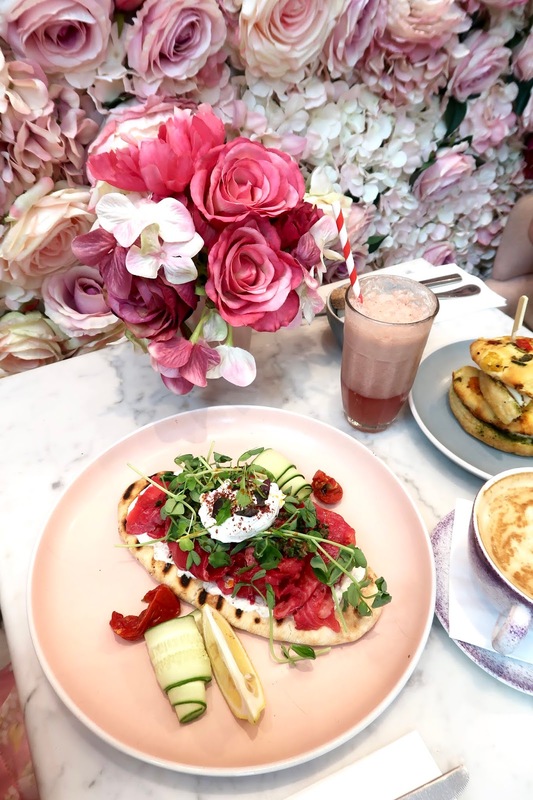 It is absolutely breathtaking inside, every area is carefully planned out and styled, from the pink menu to the marble tables, it really is a lovely experience. I also wanted to talk about the outfit I wore to the cafe. Don't worry I wore sandals and changed into my Office stilettos when I arrived, they are certainly not designed for a trip into London... To make the most out of my trip to Elan, I decided to wear this pink floral midi dress from Zara, it certainly felt like summer wearing this dress and the fabric is really flattering. I decided to pair the dress with a cross necklace from New Look and a bold statement ring that I bought from my local market. 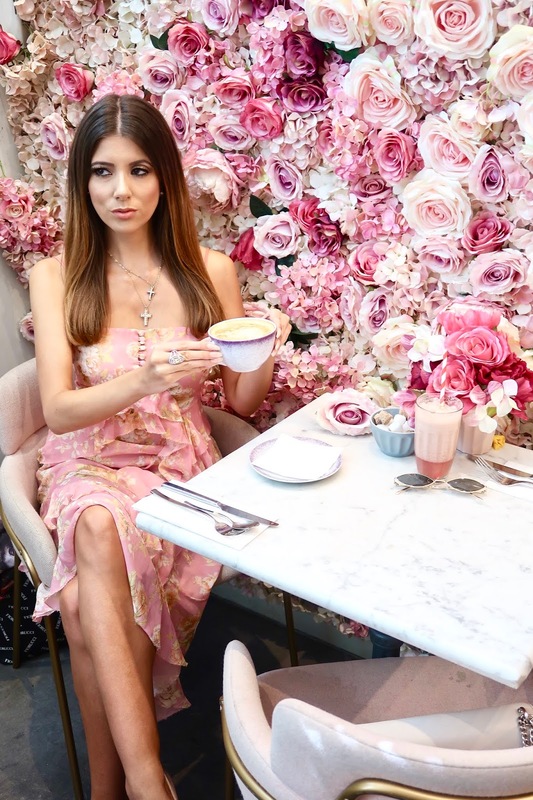 We all know I usually wear leather, tight fitted outfits so it was fun to wear a frilly, floral dress to match the cafe. So my overall opinion? Besides from stating the obvious, not only is this cafe one of the most beautiful interiors but the menu is also incredible. I loved ordering from a unique healthy, high quality menu that doesn't just offer deep fried food covered in unhealthy oils. Believe me, I am usually a big fan of hollandaise sauce and greasy, crispy bacon but I loved swapping this for a healthier alternative. On the price side of things, it may not be the cheapest but I think the overall atmosphere, presentation and quality of the food means I don't mind paying the extra few pounds.